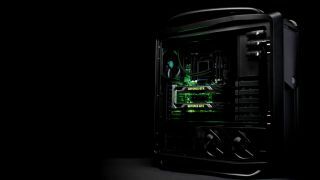 Nvidia is going to reveal its powerful, next generation Pascal graphics cards at Computex, or that's at least that's the word on the rumor mill. As PC & Tech Authority spotted, the next-generation GeForce GTX 1070 and 1080 video cards will be unveiled at the show which kicks off at the end of May. These Pascal-toting GPUs should then hit shelves starting in July, with Nvidia already starting to reduce stock of its existing cards in preparation for the launch of the new models. Obviously there's some pretty major anticipation concerning what Nvidia is bringing to the table, and ditto for AMD, with the rumour mill suggesting that Team Red will also be unveiling its Radeon R9 490/490X cards at Computex. These will allegedly run with Polaris technology and will be going directly up against Nvidia's GTX 1070/1080, although some of the buzz on the net has argued against this match-up, due to the fact that Polaris has a focus on power efficiency – which is great news for laptop GPUs, but could impact the possible performance levels we will see from the R9 490 series (assuming it does indeed use Polaris). But all of this is speculation right now, of course, although it seems increasingly likely that we will see both the R9 490/490X and GTX 1070/1080 step into the ring to face-off in a battle of specs at Computex. In other video card news, AMD's Radeon Pro Duo is expected to be available to purchase in just over a fortnight, but this beefy beast of a dual-GPU card will run to $1,499 (around £1,060, or AU$1,980).